What if you made your living passing judgement? What if you, on the rarest of occasions (and without the intention of doing so) passed judgement incorrectly? (Maybe one time in 100). What if, for each “one” time, you were mercilessly berated and held responsible for ruining the “day” of tens of thousands? Keep in mind, you were absolutely stellar and were cheered (albeit unwittingly) the other 99 times. It doesn’t matter though. That one time? It can’t possibly be made up for by the other 99 cheers you heard because, honestly?, those cheers were for someone else. That one miscue? That was ALL on you, and tens of thousands let YOU know. Welcome to the life of the professional baseball empire. How can I put this delicately?” he says. “It was a devil’s playground. It was a dark, dark time.” The umpiring profession was ripped through with drinking, promiscuity and hard living. It was also openly hostile to religion. Says another ump, Rob Drake: “Umpires are all A-type personalities. You have to run the game out there, and it carries into your personal life.” God was seen as a crutch. Trusting even other umpires felt like a vulnerability. The environment was competitive, hierarchical and cold. Guys were walking around with their masks on even when their masks were off. The ER waiting room was quiet, mostly. In one corner, a nurse was saying, “David, David,” trying to rouse an unconscious young man wearing a flowing white sheet and a pair of Warby Parker glasses. Across the room, an older Latina woman in a velour sweatsuit was wedged into a chair on her side, breathing deeply, grasping her husband. Above her was a flat-screen TV. The Padres game was on. 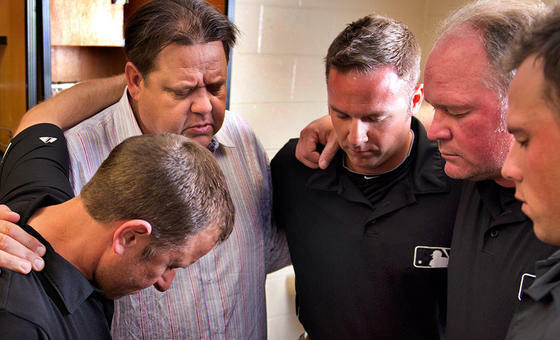 Just seconds after Pastor Dean disappeared behind the door, the TV showed a tight close-up of umpire Ted Barrett, chewing his gum expressionlessly. Behind him, you could hear a thrum of very loud boos. Suddenly, in the back of the hospital waiting room, a small, pudgy man with a soul patch who’d been pacing the way people do in emergency rooms — trepidatiously, powerlessly — reared back and shouted at the television. “That’s an out! Come on!” he said. If you were anyone but the umpire, you’d think it was life and death.